Now here is a wine you don’t see every day. I am often criticized for reviewing wines that are marketed in minute quantities. Wines, as a famous Spanish winemaker, student and philosopher puts it, of which there are more photos on twitter than bottles in circulation. Well this one isn’t marketed at all – it is in theory only distributed witin the family and shareholders of Osborne – so booyah to the haters. That being the case you may wonder how I got my hands on the liquid photographed above and the answer is simple: Territorio Era. It really is the number one spot to taste the rarer examples of these wines – and even by the glass. This one caused a bit of a splash on the social networks when its arrival was announced so after a short but enjoyable lunch we tucked into a glass. It is a fish of a similar kidney to the Solera BC 200 from the same house (and also of a very limited distribution) and is another absolute dream wine. 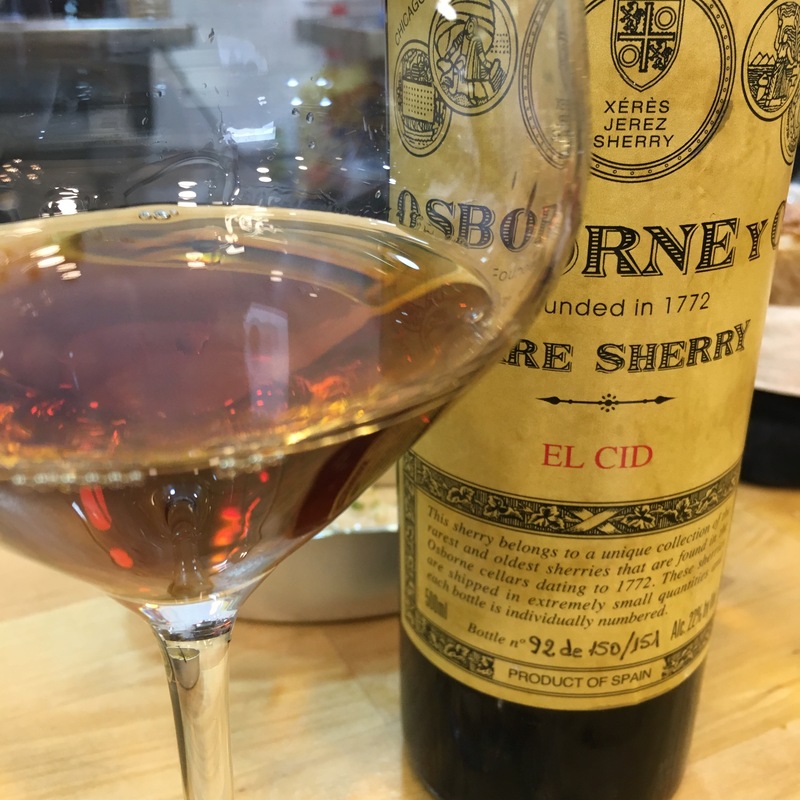 I don’t know the full details but I would guess it was a very, very old but very fine amontillado with a small and very nicely judged, perfectly integrated percentage of pedro ximenez. As you can see, it has that dark, more intense colour that the pedro ximenez can impart. On the nose it was quiet but there was a lot in there: sweet figs, roasted nuts, bready Christmas cake. Then on the palate it was like a sort of nectar on steroids. The sweetness of the pedro ximenez lifting it and making it absurdly easy to absorb, but not hiding the fact that there was a lot of wine in there. A rapier, cool acidity first up then very intense flavours of those figs and walnuts, slightly burnt cake and just tending to sawdust before an eternally long and pleasantly sweet nut and fig finish. And no edges or joins anywhere in sight – like one of those baths carved from a single piece of wood this is all curves and smooth surfaces.